First published in 1993 and hailed as a classic, Yankee Rock & Ice is now reissued in a new edition with four new chapters covering the 1990s through today to bring the book up to date. 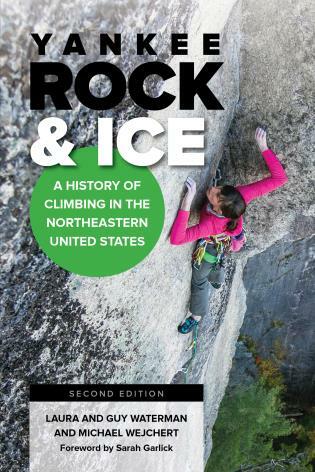 This comprehensive and entertaining history of roped rock and ice climbing in the Northeast traces the growth of this popular sport in New England and New York and covers the first trailblazers of the eighteenth century through today’s events and personalities. Well-known mountaineers and preservationists, Guy and Laura Waterman have explored every corner of the mountains of New England and New York and done solid historical research on first ascents of classic routes and the climbers who have made them legendary. Climber Michael Wejchert joins Laura for the work on the second edition. Laura and Guy Waterman have been dedicated volunteers for the U.S. Forest Service and for hiking and conservation organizations, maintaining New Hampshire’s Franconia Ridge trail for nearly two decades. Energetic explorers of White Mountain terrain, on and off trail and in all seasons, the Watermans carried a feet-on-the-ground knowledge of the land they so passionately wrote about. In 2012, the American Alpine Club awarded them the David R. Brower Conservation Award for Outstanding Service in Mountain Conservation. After Guy’s death in 2000, Laura and friends founded the Waterman Fund to carry on their vision of preserving wildness and conserving the alpine areas across the Northeast. Laura lives near their original homestead in northern Vermont and has published her work in various literary magazines and journals, including Appalachia and Alpinist. Michael Wejchert has climbed all over North and South America and Canada, but settled in New Hampshire because he likes the spirited climbing community, rainy rest days, and living ten minutes from Cathedral Ledge, one of the best cliffs in the country. He works as a climbing guide, a carpenter, and a writer. The winner of the 2013 Waterman Fund Essay Contest, he has contributed to Rock and Ice, Gripped, Alpinist, Ascent, Appalachia, and The New York Times, among others. When Michael’s not working, he can be found trail running, rock climbing, ice climbing, or in a tent, waiting out a storm in the Alaska Range. He lives in Jackson, New Hampshire.